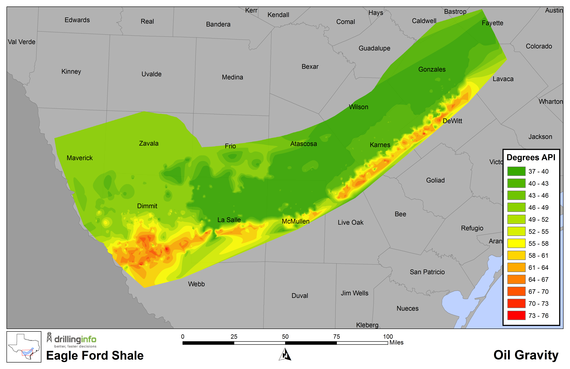 The 26-county Eagle Ford Shale in Texas extends in a 400-mile arc from southwest to east and north of San Antonio, in Bexar County. Karnes Trough is the center of the play. The three counties in the play that currently produce the most are Gonzalez, Karnes, and LaSalle. The Eagle Ford was developed first as a natural gas play, then later for its liquids. 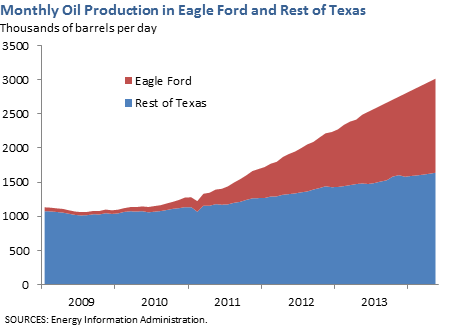 Eagle Ford liquids production (oil and condensate) will grow to an estimated 1.5 million barrels a day (BPD) by September 2014, according to the Energy Information Administration (EIA). The region is also expected to produce 6.6 billion cubic feet a day (BCF/D) of natural gas by September 2014. The Texas Railroad Commission map below shows the production area. 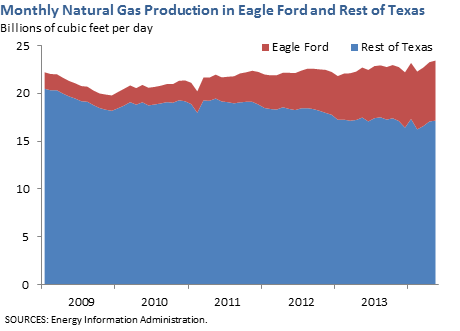 The rapid growth in Eagle Ford natural gas and liquids production is shown below in EIA graphs supplied by the Dallas Federal Reserve. It is important to note that "liquids" includes both crude oil ("black oil") and condensate, and that condensate makes up a much larger percentage—as much as fifty percent—of Eagle Ford liquids than it does in the West Texas Permian Basin or the North Dakota Bakken. A photo by Joshua Doubek made available in Wikipedia shows an Austin Chalk-Eagle Ford contact at a location near Dallas. 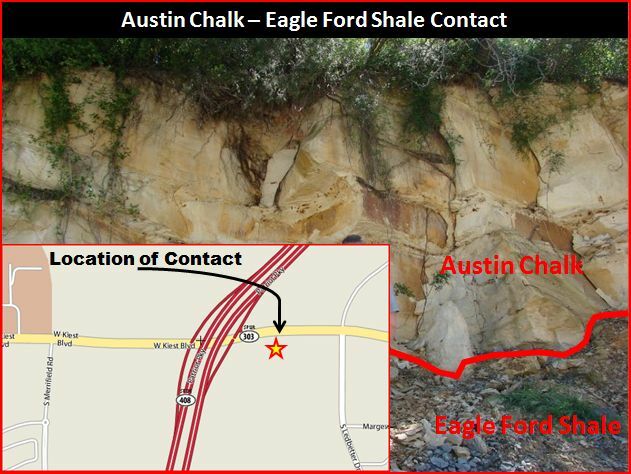 According to the Texas Railroad Commission, the Eagle Ford is also the source rock for the Austin Chalk and for the East Texas Field. As of July 7, 2014, Eagle Ford drilling permits numbered 5,684 drilling permits. Total wells completed in the play include 6,414 for oil and 3,214 for natural gas. Oil's density is measured by degrees of API (American Petroleum Institute) gravity. The lower the number, like 10-20 for certain Venezuelan and California crudes, the denser the oil. Obviously, the higher the number, 35-80, refers to a less dense liquid. Standard West Texas Intermediate crude is 40-gravity. Most of the oil found in the Bakken and Permian plays is in the 40-gravity range. Because the Eagle Ford has "windows" ranging from gas to condensate to oil, its liquids are generally lighter. There is no agreed-upon definition for condensate. However, generally anything above 45-55 degrees API falls into the condensate category. A map from DrillingInfo via The Wall Street Journal (June 25, 2014) shows the range of API gravities of Eagle Ford production. 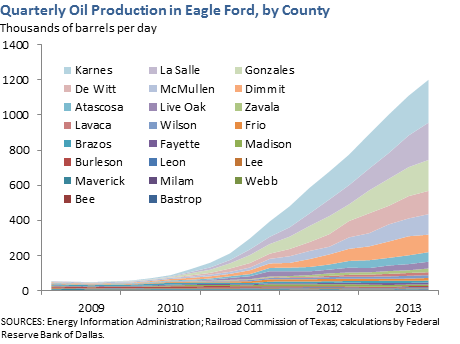 According to the Texas Railroad Commission, between January and May 2014 the average Eagle Ford production was 878,000 BPD of oil and 228,000 BPD of condensate, an 80-20 oil-condensate mix. Others argue production is closer to a 50-50 mix. Richard Mason, Senior Technical Director for Hart Energy, notes the Eagle Ford covers 11,000 square miles, or seven million acres. Reserves are estimated at fifteen billion barrels of oil equivalent (BOE). At today's pace of 1200 wells per quarter, fourteen years' worth or 70,000 drilling locations remain. Mason says wells range from 300,000-500,000 BOE in estimated ultimate recovery (EUR). 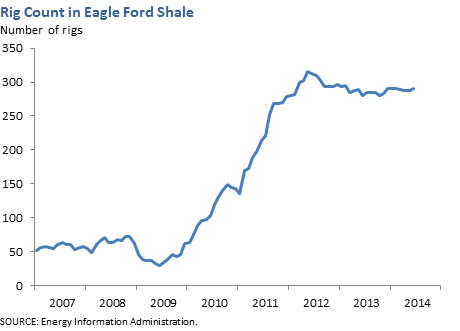 The EIA reports 300 rigs in the Eagle Ford: most are drilling for oil. Drilling efficiencies have increased: the spud-to-release time has dropped from 32 days to 20 days now. The EIA makes available drilling efficiency charts for each major US region. The one for the Eagle Ford can be found here. Downspacing and acceleration is occurring in the Eagle Ford and elsewhere. Whereas wells might have originally been 320 acres apart, now they are 80 acres apart or less. Downspacing is part of the increasing "intensity" trend in the Eagle Ford and other basins. Per Mason, this equates to longer laterals for horizontal drilling, more water, more stages per lateral, and more pounds of sand or proppant per stage. For example, fracking a well might have originally required six million pounds of sand or proppant. Now sand use in fracking a well has climbed to 9-12 million pounds. It is easy to see why drilling these wells require trainloads of sand or proppant, and why Wisconsin sand mines are booming. Driving this increase in intensity are the resulting higher initial rates of production. The Commerce Department recently decided to allow two Texas companies to export processed condensate. This bodes well for the Eagle Ford region. Condensate appears to be export-eligible once it has been stabilized or run through a small-scale distillation tower. According to a story in Rigzone by David Garcia and Noe Torres, Mexico is also discussing importing light oil from the United States for its refineries, up to 200,000 barrels per day. Natural gas exports to Mexico from the U.S. are 2 BCF/D. Another 2.4 BCF/D of pipeline capacity through south Texas to Mexico is planned. 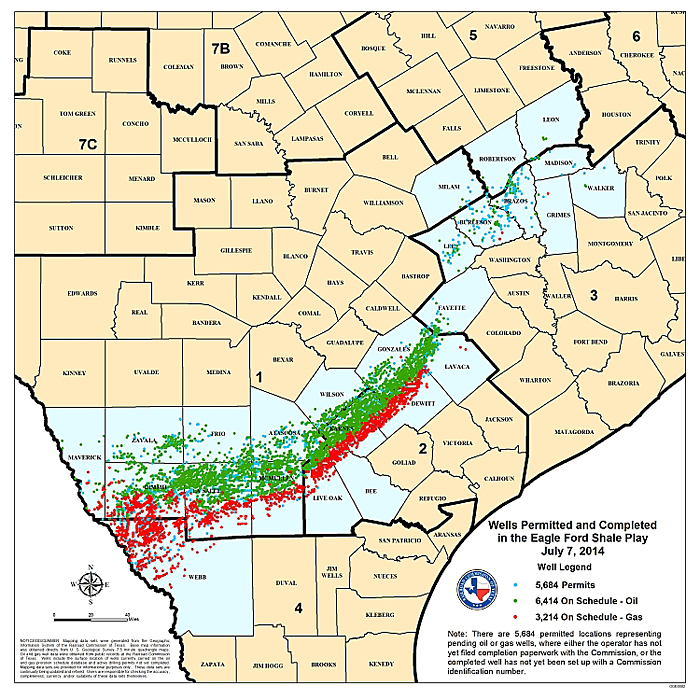 Note that the Eagle Ford Shale extends across the border into the Burgos Basin, where it is called the Boquillas Formation. However, its development in Mexico is not expected soon. Liquefied natural gas (LNG) exports from the U.S. Gulf Coast are on the near horizon with approval of Sabine Pass Liquefaction, Cameron LNG, Lake Charles Exports, and Freeport LNG. Combined, these four facilities will have the capacity to ship 7.3 BCF/D of gas. Sabine Pass, the furthest along, is expected to be operational by 2015. The graphs below are provided by the EIA, the Texas Railroad Commission, and the Federal Reserve Bank of Dallas. 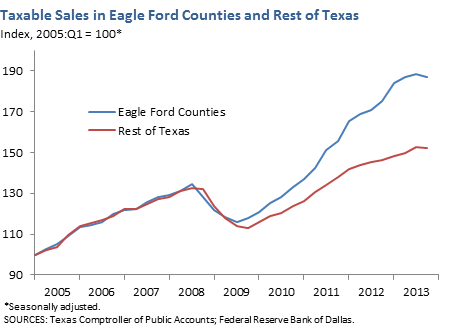 They show Eagle Ford gas and liquids production by county and the increase in taxable sales in the region. 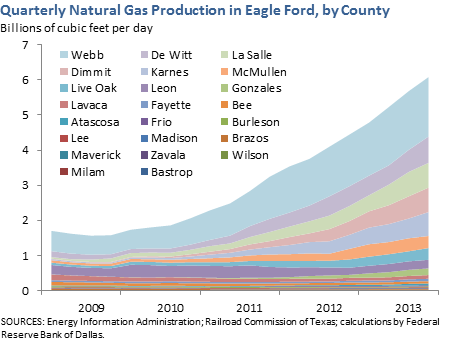 Altogether, the Eagle Ford Shale is an example of economically compelling growth. Copyright 2014, Starks Energy Economics, LLC.